About "Non terminating repeating decimal"
What is non terminating repeating decimal ? A decimal number that continues infinitely with repeated pattern. In the above three examples, digits after the decimal point continue infinitely with a repeated pattern. How do we have this non terminating repeating decimal in math ? When we divide an integer by another integer, we may get the result in different forms. In those results, non terminating repeating decimal is one of the forms. Let us consider the fraction 125 / 99. When we divide 125 by 99, we get "Non terminating repeating decimal". It has been explained below. 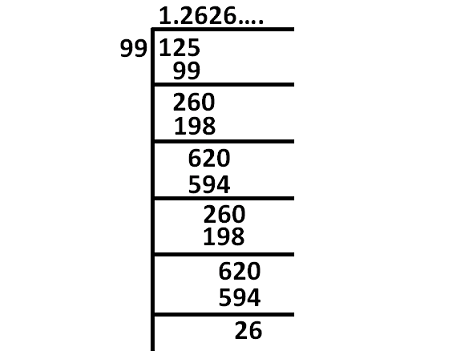 From the above long division, we can clearly understand how we have non terminating repeating decimal. When we divide 125 by 99, the digits after the decimal keep going infinitely and the repeated pattern is 26. How to convert non terminating repeating decimal to fraction? Identify the first repeated pattern and second repeated pattern as as explained in the example given below. Count the number of digits between the decimal point and first repeated pattern as given in the picture below. Since there is 1 digit between the decimal point and the first repeated pattern, we have to multiply the given decimal by 10 as given in the picture below. Note : In (1), we have only repeated patterns after the decimal. Count the number of digits between the decimal point and second repeated pattern as given in the picture below. 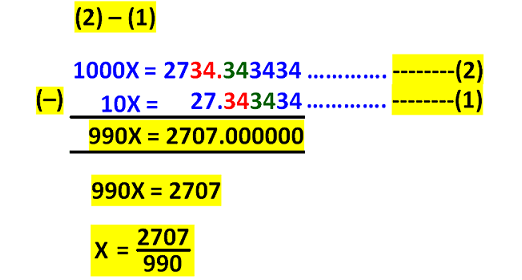 Since there are 3 digits between the decimal point and the second repeated pattern, we have to multiply the given decimal by 1000 as given in the picture below. Note : In (2), we have only repeated patterns after the decimal. Now, we have to subtract the result of step 5 from step 7 as given in the picture below. 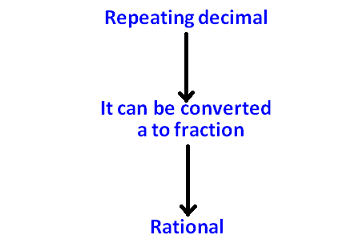 To have better understanding on conversion of non terminating repeating decimals to fraction, let us look at some problems. After having gone through the stuff and examples, we hope that the students would have understood, "non-terminating repeating decimal"